I’ve mentioned PAWS before; this tiny little charity does good work here on the Pelion finding homes for the innumerable homeless cats and dogs, in addition to conducting sterilisation programmes as often as funds and volunteers allow. In the words of the song: “Money! Money! Money!” and PAWS does all it can to raise some. 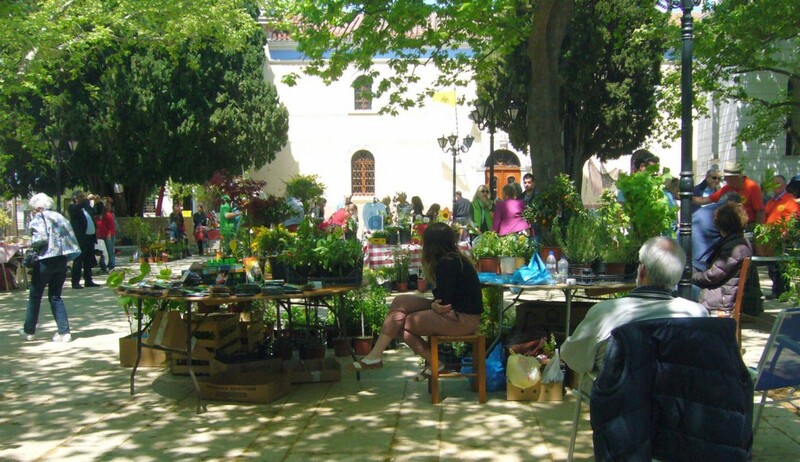 In April last year PAWS took a table at a bazaar being held in Lafkos in order to sell donated goods such as books, plants, cakes. My husband and I had been in Texas for several months; I flew back alone ahead of him and made the journey up to Volos from Athens by bus. Friends very kindly picked me up and filled me in about the goings-on during our absence. We discussed the fundraiser being held in less than two weeks, and the need for items. 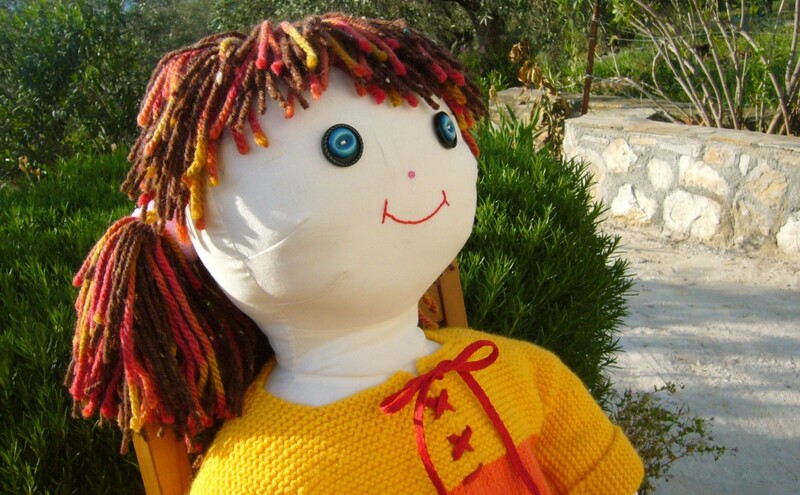 “I’ll make a doll to raffle,” my tired, jetlagged self announced. I started that very night, for my sleep patterns had of course taken a direction of their own. I managed to dig out a doll pattern from my collection, noticing dimly that the pattern pieces seemed rather large. A suitable piece of muslin for the body came to hand, and I began cutting out legs, arms, a gusseted body, as well as some involved shapes for the face and head. Hmm, it did seem a little more sophisticated than the stick figure ragdolls I’d sewn up for bazaars and fairs in the past. The animals had missed us, so much help was forthcoming from various cats who found the rustling tissue paper pattern irresistible. Such fun! Finally the cutting was done and so was I, heading off to bed with the rising sun. By mid-morning a few doubts set in. What on earth had I taken on? 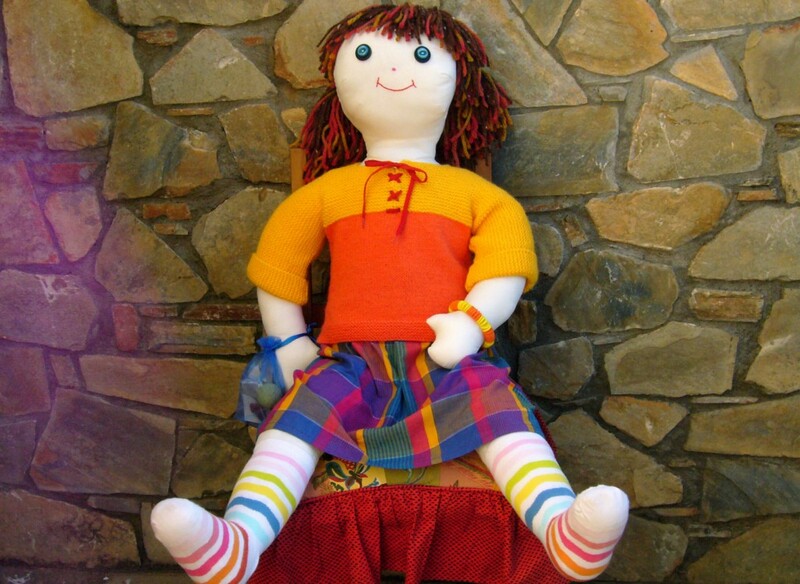 I briefly debated making a much smaller doll, tossed out that idea and set to work at the sewing machine. 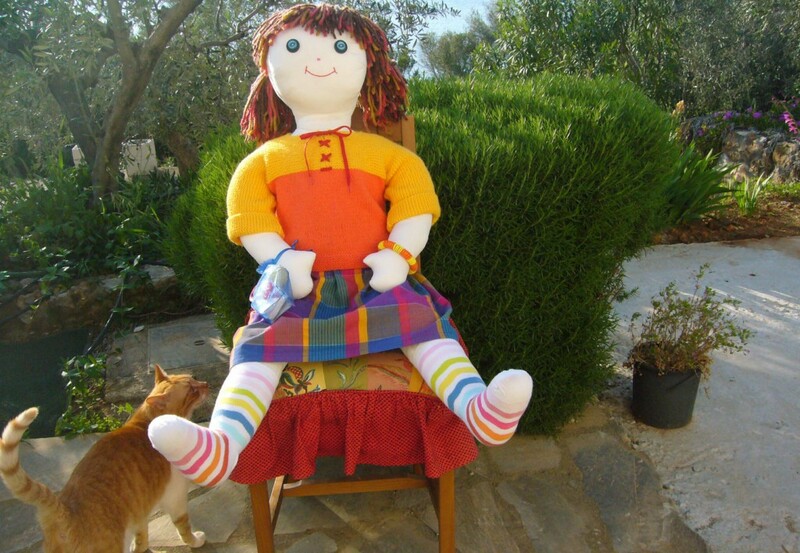 Fortunately interruptions were few and I could make my own hours, but Dolly was a most demanding piece of work. She was unwieldy to sew; her head and face were well designed, but finicky, and her body seemed alarmingly huge. Parts of her had to be stuffed before being joined to other segments and it soon became clear that I had nowhere near enough fiberfill to complete the task. Not only was I in no position to zap to Volos, I seriously doubt that I could have found what I needed there anyway. That problem was solved by gutting the pillows of the guest beds, but the question of her outfit began to raise its head. My fabric and yarn stashes are well stocked, so materials wouldn’t be a problem, but time would. I pressed on. Her face was done fairly quickly – I opted for a very basic look. Ah, my button jars, how do I love thee, but hair! And no, not the musical. How was I going to do hair? That turned out to be the most difficult part of getting Dolly together. I should, in retrospect, have dealt with her hair before attaching the head to the body as Dolly became very unwieldy and every attempt to get her well coiffed only succeeded in a look that would have fitted in well for Halloween. I resorted to three different knitting yarns, but the end result, after a ridiculous amount of work, can only be described as a great disappointment, and that’s putting it kindly. A skirt was easily made; her sweater took more time. The Saturday morning market in the village provided knickers – a child’s age four – for Dolly is slim of hip, and cheerful socks in a woman’s size. I finished her that afternoon, ready to send her out into the world with a few necessities in a cute little reticule (a repurposed confetti sachet) and a touch of adornment in the form of a bead bracelet. 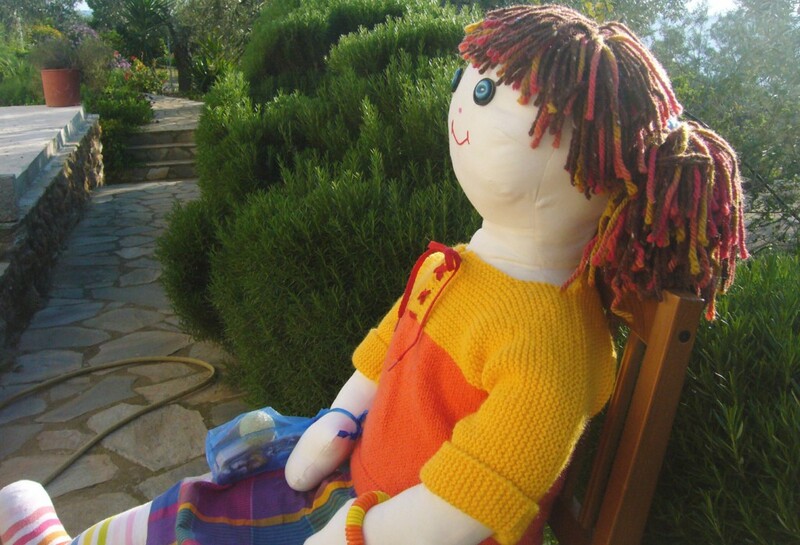 Early the next day, good friends came to fetch us, Dolly and me, and we drove up to Lafkos. Dolly sure did attract attention for she had not been seen in public before then, but she was quietly gracious, allowing herself to be photographed with admirers, smiling all the while, performing her duties without complaint, while we sold raffle tickets on her behalf. By late afternoon the bazaar was coming to an end and we got ready to draw the winning ticket. The box was shaken, we stirred the slips of paper around, and then, to great excitement, a ticket was pulled out. The number was read, the lists consulted, and we had a winner! Hooray! 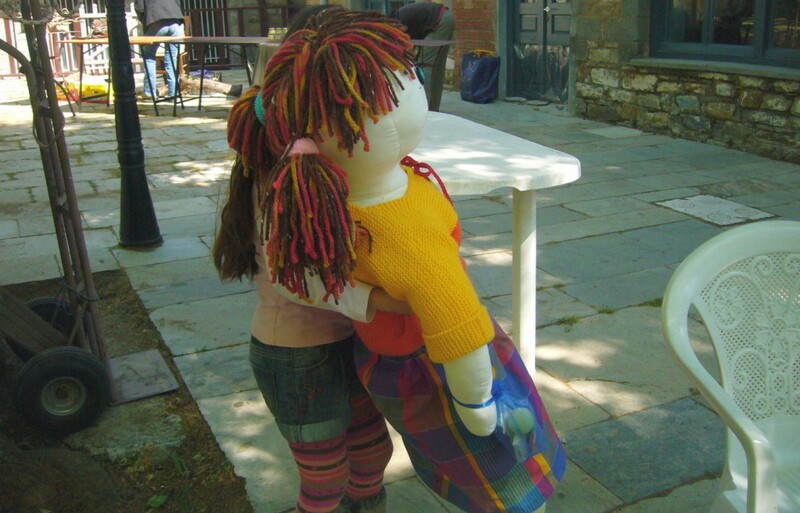 We were thrilled to discover that our lucky ticket holder was the most enchanting little girl; a local child, she’s fluent in English and Greek and has the sweetest disposition. The family had already left, but we called and before long she arrived with her father to claim Dolly. I think our winner was almost in shock, but she thanked us beautifully – her manners are impeccable – and stood patiently while we oohed and aahed and took pictures. As you can see, she and Dolly are about the same size. Dolly lucked out too, for she’s much loved; I was delighted. The adorable winner taking Dolly to her new home. The day had been a great success, raising some much needed funds for PAWS, but as with all charities, there’s never enough money and we continue our efforts. 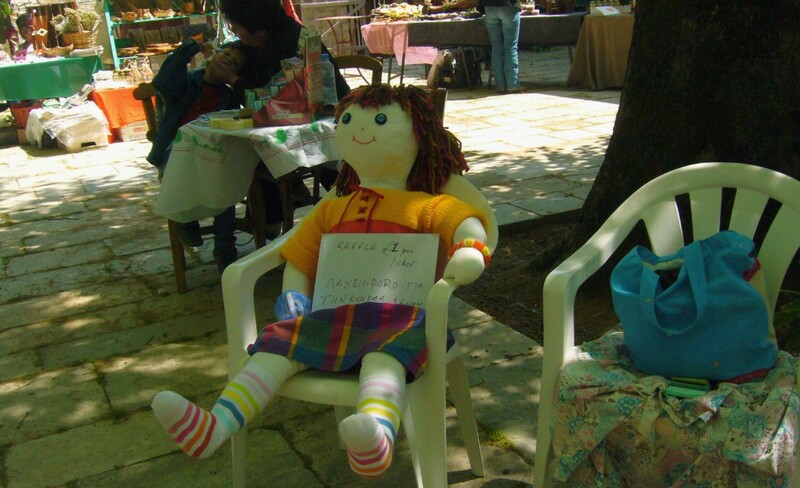 This year we held a barbecue at which we sold tickets for various raffles, and guessed the weight of a cake. 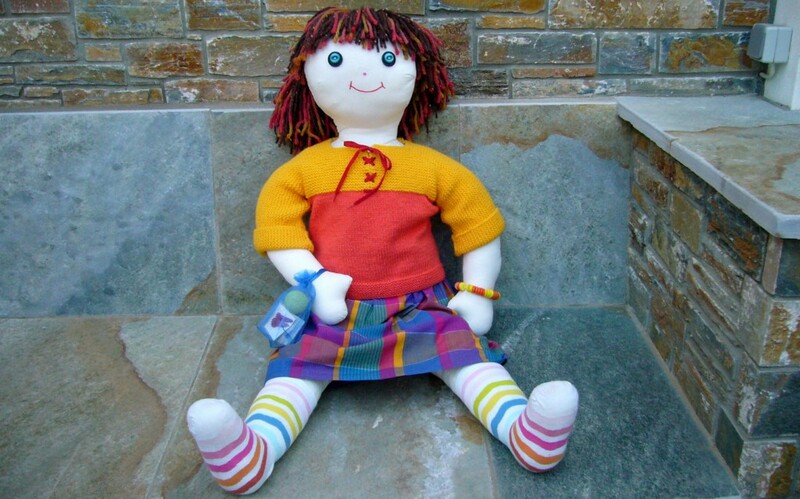 I donated a doll, but one which I picked out at a store. Dolly she was not – been there, done that!